We Love Green Festival have revealed the second wave of artists performing at this year’s event. Charlotte Gainsbourg, Nina Kraviz, Sampha, Dixon and Mount Kimbie are just a few of the names joining the fray alongside previously confirmed acts Bjork, Tyler The Creator, Beck, and more. 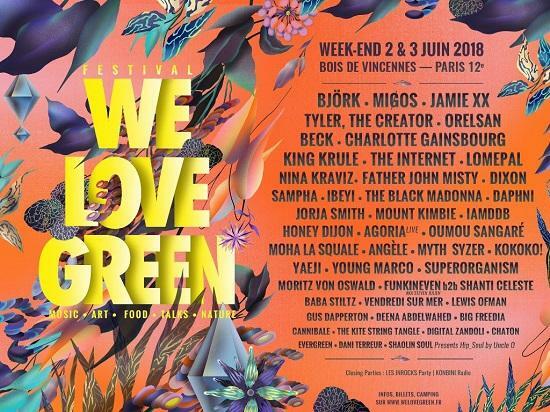 This year, We Love Green Festival, who pride themselves on promoting diversity and eco-friendliness, will take place June 2-3 at Le Belle Etoile in the Bois de Vincennes Forest. Speakers at the Think Tank at this year's event include Ernst Zürcher - a forest engineer, doctor of natural sciences and author of the book The Trees and The Invisible, Isabelle Delannoy, an agricultural engineer, and author of the book ‘Symbiotic Economy' and François Sarano - a doctor of oceanography, professional diver, and former scientific advisor to Jacques Cousteau. For the full line-up and tickets click here.